This error message is due to the missing MBCS MFC package. Starting with Visual Studio 2013, MBCS portion of the MFC library has been broken out of the Visual Studio product into its own separate download. Installing this package and rebuilding should fix the problem. Starting with Visual Studio 2015, the entire MFC C++ library (including the MBCS pieces) is an optional install component. 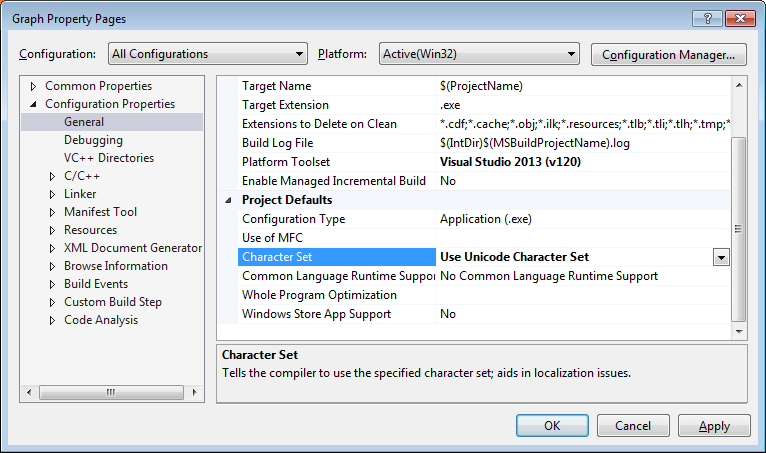 While installing VS2015, if you select C++ and MFC, you will also get the MBCS library. Instead of installing an add-on, you may consider changing the character set from MBCS to Unicode. This is done in the project properties as is depicted below. According to Redistributing the MFC Library article on MSDN, there are no mfc140.dll files in redist directory (c:\Program Files (x86)\Microsoft Visual Studio 14.0\VC\redist\x86). The mfc140.dll files were omitted from the redistributable files directory in Visual Studio 2015 RTM. You can use the versions installed by Visual Studio 2015 in the Windows\system32 and Windows\syswow64 directories instead. Not the answer you're looking for? Browse other questions tagged c++ visual-studio-2013 mfc visual-studio-2015 mbcs or ask your own question. How do I set unicode as character set in the ALL_BUILD and ZERO_CHECK Visual Studio 2013 projects that are generated by Cmake? Where is Multibyte MFC Library for Visual Studio 2015 community ed?